The Greenway at Knaptoft House Farm FarmhouseFarmhouse Bed & Breakfast or Room Only at its best surrounded by beautiful views over rolling Leicestershire countryside. Set peacefully well back from the road yet easily reached from motorways and city of Leicester. 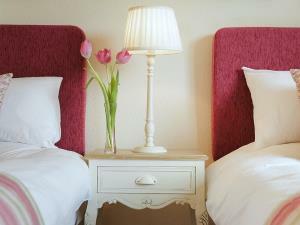 Our accommodation is warm and welcoming with those little extras that make your stay a memorable one. Children are welcome any age if all 3 rooms are booked. Children welcome from age 10. 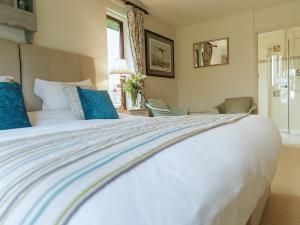 The Greenway at Knaptoft House Farm sometimes limits bookings to 2 or more days. Spacious room in The Greenway over looking the garden. This room has a zip & link bed for twin or super-king sized bed. An extra bed can be added to this room.Larger bathroom. Greenway 1 sometimes limits bookings to 2 or more days. Spacious room in The Greenway overlooking the fields.This is twin bedded. Greenway 2 sometimes limits bookings to 2 or more days. Sat Nav users.Our postcode LE176PR will bring you up our drive to the Property. Accessed from M1 (junction 20 or 21), M6 (junction 1), A14 (junction 1). Leave A5199 at the crossroads with Bruntingthorpe to Saddington Road, adjacent to Shearsby, turning for Bruntingthorpe we are midway between Shearsby and Bruntingthorpe. A large reflective sign is erected at the entrance to the private drive. Please don't follow the signs to Knaptoft Church. We were made very welcome and it was the perfect stop in a long journey. Thankyou so much for your lovely comments !